I have never felt more comfortable setting up for a media interview! I would like to extend an extremely sincere thank you to the crew over at BT Calgary for hosting me this morning! Sandra’s emails make me laugh, although I am not much of a hugger Glen’s hugs are much appreciated, camera crew (sorry I am not that great with names!) you are both awesome and Tara-I don’t think BT could have picked a sweeter host for the morning show! I was worried I was going to be half asleep but the energy in the room was enough to wake anyone up (and not be grouchy about it;) Take a peek at the video, tell me you love my new top and try cooking your baby’s cereal from scratch! Happy Family Day Everyone! 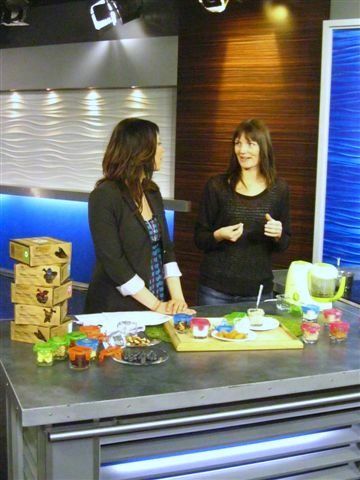 Check out the clip on BT Calgary’s website! Thanks for the support everyone! This entry was written by Melissa, posted on February 22, 2011 at 6:20 am, filed under Baby Foods and tagged BT Calgary, Cooking Demo. Bookmark the permalink. Follow any comments here with the RSS feed for this post. Post a comment or leave a trackback: Trackback URL.